John Francis Wheaton was a late 19th Century and early 20th Century lawyer and a politician. Wheaton ran for elective office in three states and was the first African American to serve in the Minnesota House of Representatives. John Francis Wheaton was born on May 8, 1866 to Jacob and Emily Wheaton in Hagerstown, Maryland. He graduated from the high school division of Storer College in Harpers Ferry, West Virginia in 1882. During the decade after his graduation Wheaton worked as a public school teacher, then attended Dixon Business College in Illinois, and later moved to Washington D.C., where he worked as a clerk for the United States Congress until 1892. In 1889, Wheaton married Ella Chambers and the couple had two sons, Layton J. and Frank P. Wheaton. Wheaton graduated from Howard’s Law Department in May 1892 and set up a practice in Hagerstown. He was only the fourth African American to pass the bar and practice law in Maryland and the first outside Baltimore. In 1893, however, Wheaton moved to Minneapolis, Minnesota where he worked as a clerk in the state legislature and also as a deputy clerk in the Minneapolis municipal courts. The following year he became the first African American to graduate from the University of Minnesota Law School. Wheaton had a lifelong affinity for politics. In 1885 at the age of nineteen he gave his first political “stump speech.” By twenty-one, he was an unsuccessful candidate for a seat in the Maryland State Legislature. He served as a delegate in 1887, 1889, and 1891 to the Maryland’s State Republican Convention and was elected temporary chairman of the 1889 Convention. At the age of twenty-two Wheaton attended the 1888 Republican National Convention in Chicago as an alternate. He was one of the youngest delegates at the convention and among a handful of black delegates. After moving to Minneapolis, Wheaton quickly became involved in Minnesota politics. He was elected to serve as alternate delegate to the 1896 Republican National Convention in St. Louis. Two years later on November 8, 1898, Wheaton was elected to the Minnesota House of Representatives to represent the 42nd District. While holding his only elective office, Wheaton was instrumental in passing the 1899 civil rights statute that ended discrimination in public accommodations and transportation. He also lobbied for permitting African American soldiers to fight in the Spanish-American War. Wheaton again represented Minnesota at the Republican National Convention when it met in Philadelphia in 1900. He did not win reelection to the legislature in 1900 and instead practiced law briefly in Minneapolis before moving to Chicago to work for an insurance company. He relocated again in 1906 to New York City and switched to the Democratic Party. Wheaton practiced law in the city until his death. He worked for the New York City District Attorney’s office from January to May of 1920. His final foray into politics came in 1919, when he ran unsuccessfully for the New York State Assembly. 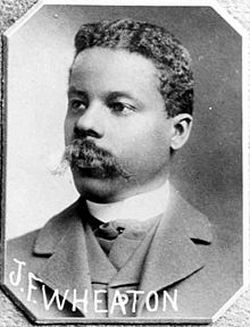 John Francis Wheaton died at the age of 56 on January 15, 1922 in his home in Harlem. He was survived by his second wife (Dora), sons (Layton and Frank) and a stepson (Richard Weston). "It's a Fact! (John Francis Wheaton)," Session Weekly, (St. Paul: Minnesota House of Representatives Information Office, February 21, 1992), 14; Marion Daniel Shutter, "John Francis Wheaton," Progressive Men of Minnesota, Marion D. Shutter, D.D. and J.S. McLain, M.A. eds., (Minneapolis: The Minneapolis Journal, 1897), 350-351.